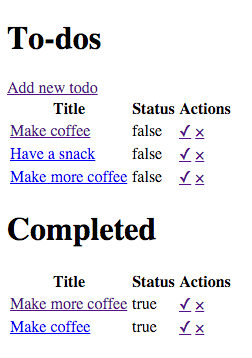 Next, I needed to add a few todo items to have some data to work with. For whatever reason, adding new todos worked fine on my main machine, but when I tried to add a new item, I was getting a “First argument in form cannot contain nil or be empty” error. Turns out I had never defined the “new” action in the controller. Took care of that and the app was back in business. It only makes sense to be able to create and delete items from the main list of to-do items, so added that feature. It also makes sense to sort the list into “open” vs. completed to-do items; time for a crash-course in Ruby conditional syntax—turned out not to be a very hard crash. It also makes sense to have a one-click “complete” button on the list of items, but that is a bit tricky. The current method (going to the edit screen for that item) is a bit clunky. My first thought was to build a `<form>` in the actions column for each item, complete with an `<input type=”hidden” name=”completed” value=”true”>` element, but realized that it would likely clear out the the other two fields. My next thought was to add hidden inputs for the title and notes fields, but then the app is printing a bunch of hidden content, plus I’d have to come back and update the form here every time I added or changed fields. I possibly could extend the `_form.html.erb` partial for use here, but there’s still the “bunch of hidden unnecessary content” issue. Time to try writing a custom route and controller action to update just the one field from a one-click button. Took some working through to get the syntax just right; more info below. patch 'todos/:id', to: 'todos#complete': a new route that points the patch method to the complete action. If we can have one-click completion, why not one-click “uncompletion” as well? No reason not to…. The only changes necessary were updating the link_to in the completed section and adding a wrapping condition to the complete action; it tests whether completed is true or false and toggles it. At this point, I also added a backup: if the @todo.update call fails, then the app will render the edit screen, where the change can be manually made. I haven’t made as much progress the last few days as I had hoped, but ran into some interesting and fun challenges today.